← Cypress Dome Swamps and Pine Flatwoods of Florida! The aesthetics of sustainability is an unsuspected guiding light. The way our surroundings look, feel, are organized or not, and function is a molder of our interest, comfort, motivation, acceptance, and so much more. I believe our surroundings affect how we feel, our outlook, mental health, physical health, and values. Many people in western society have very little to do with actively creating their surroundings. Our homes are generally built by strangers in preplanned neighborhoods, the plants in our yards prescribed by HOAs, our furniture and accessories bought at big box stores, identical products available nationwide. What if we had a more participatory role in creating our surroundings? How would we feel surrounded by a home our family built from bioregional resources? 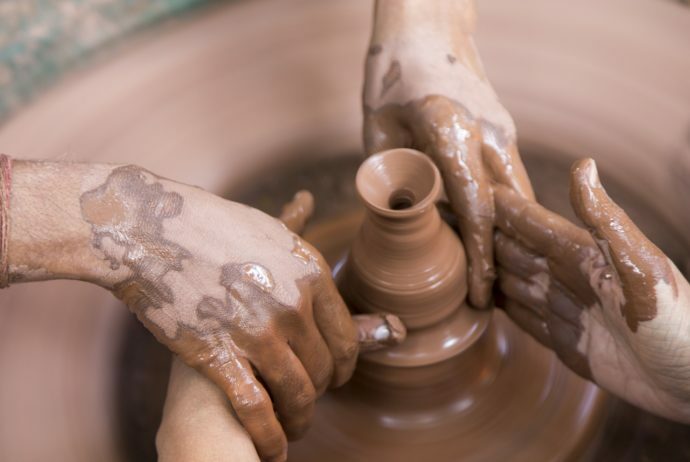 What stories would would be cultivated and passed on in working a potter’s wheel to make bowls with our grandmother? We might decide not to fill our houses with meaningless stuff, and choose instead a simple lifestyle infused to the core with meaning and stories. Not only is the industrially-made aesthetic boring, but every stage of production and transport is not sustainable. Uniformity is not a principle of resilience. Even though most of our disposable products are made in China and Bangladesh, the emissions created in those places effect us all. If there’s one good thing about globalization, it’s realizing that we’re all in this together. And even though we’re all in this together, maintaining bioregional cuisine and seasonal living is just another part of the aesthetics of sustainability. As John Dewey (1947, 45) writes, one cannot form an experience fully without an intellectual aesthetic to “stamp” to be complete. However, on a tangible level, my sense is that aesthetics draw people in, make them feel inspired, at home or alien, and motivate them to action. Aesthetics can be a manipulation tool; think of any tv ad or the decor Whole Foods chooses. Attention to aesthetics is not and should not be applicable only to those with enough disposable income to “decorate.” Part of the appeal of simple living is that it’s an affordable way to become a radical homemaker. Everyone is affected by aesthetics. The aesthetics of sustainability are simple, minimal, useful, and handmade; they are bioregionally different and appropriate; they possess a “satisfying emotional quality” and an “internal integration and fulfillment” (Dewey 1947, 45). Many stores are trying to market and sell the aesthetic of sustainability such as Whole Foods, Crate & Barrel, Anthropologie, Etsy, World Market, ad nauseum. The problem is that these are still outlets for the “consumer” and do not contribute to sustainability, but perpetuate consumerism. My sense is that these businesses are doing so well because people are yearning for the aesthetics of sustainability, and they intuitively know what to look for, but they are either too distracted, busy, uninformed, and overwhelmed with marketing that they don’t realize that they are not achieving what their inner desires seek through their purchases. Often in pondering issues of sustainability and “how we ought to live,” (Quinn 1995) my mind settles on the lack of quality time. We, myself included, busy ourselves too much to take the time to make things, grow food, and cook by hand. Why do we do this? We do this to put a roof over our heads, eat, and maybe get an education; it’s a capitalist system. I imagine a cooperative system would help us toward a better aesthetic of sustainability. It may be idealistic, but perhaps beginning with an aesthetic of sustainability can help inspire us toward regenerative practices. Dewey, John. 1947. “Having an Experience.” In John Dewey The Later Works, 1925-1953,edited by Jo Ann Boydston, Textual Editor, Harriet Furtst Simon, 42-63. Carbondale and Edwardsville: Southern Illinois University Press. Quinn, Daniel. 1995. Ishmael: An Adventure of the Mind and Spirit. A Bantam/Turner Book.